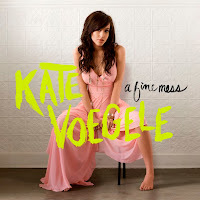 Kate Voegele's sophomore release, A Fine Mess, is now available! The Mike Elizondo (Maroon 5, Natasha Bedingfield) produced album features the single "99 Times" and is currently streaming in full on Kate's MySpace page. Like what you hear? Amazon MP3 is offering a great deal to grab the entire album for only $2.99. Follow these simple instructions to get the discounted tracks from Kate's album page on MySpace.